The ETF Maximizer by 401k Maximizer, Inc. was developed specifically for ETF's -- Exchange Traded Funds. Using ETF's instead of either traditional mutual funds or stocks has some very definite advantages and a very few pitfalls. It's important to understand these considerations. A big advantage is that the commissions for buying and selling ETF's are typically the same as buying and selling a stock. In comparison, the commission to buy and sell some traditional mutual funds can be quite large depending on which brokerage is utilized for the account. Regardless, you must take into consideration the drag on your portfolio that a system like ETF Maximizer can have as a result of commissions. A good way to evaluate this problem is with the table below. This table assumes a commission charge of $7 per trade. 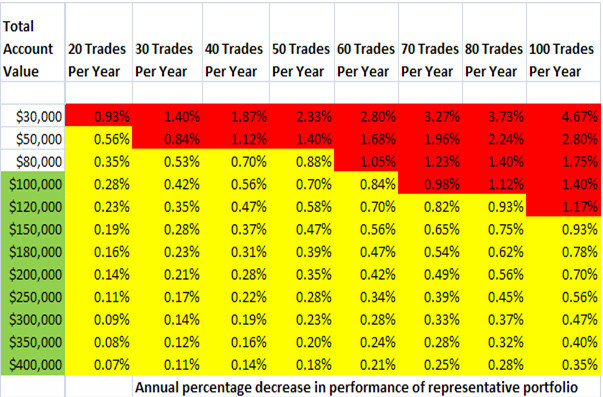 You can expect somewhere in the range of 50 trades per year following the portfolio recommendations in ETF Maximizer. Therefore, as the table shows a total portfolio of $100,000 making 50 trades per year at $7 per trade would experience a 0.70% drag on portfolio performance due to commissions. We consider commission drag on a portfolio of more than 1% per year to be unacceptable. Therefore, as the table illustrates accounts with less than $80,000 should probably not be used to follow the portfolio recommendations in the ETF Maximizer newsletter. Using ETF’s in place of traditional mutual funds allows us to avoid all the special early redemption fees and other special fees that brokerages and mutual fund companies place on many mutual funds. This is a significant advantage of ETF's! ETF's are relatively broad based, each with many holdings, thus they provide much more market diversification than holding single stocks. Often an ETF will have a higher daily volume than a typical stock or mutual fund, thus providing high liquidity. ETF's typically have much lower management expenses than either market index funds or traditional mutual funds. Holdings of ETF's can be determined with certainty as compared with holdings of mutual funds which can change often and reported infrequently. On the other hand, ETF's can have significant differences between their bid and ask prices. In general this can be managed by utilizing only those ETF's with high trading volume. We address this issue by constantly analyzing the complete universe of ETF's and selecting only those with the highest volume over the last 3 months for consideration in our rankings. Using the ETF Maximizer means you can always stay invested in the top performing ETF's both in terms of returns and risks. You can save your valuable time in analyzing the markets and the ETF's and leave that work to us. By using the ETF Maximizer, you can gain control over your investments and retirement planning. Of course the bottom line advantage for the ETF Maximizer is making money. Please note that all market investment involve risks to capital. Past returns are not a guarantee of future results.